Kedarnath is located in the Rudraprayag district of Uttarakhand at an elevation of 3586 meters above the sea level. It is nestled in the lap of imposing Garhwal Himalayan ranges and near the holy river Mandakini. There are around more than 200 shrines situated in this region in which Kedarnath is the most sacred one. Kedarnath is located near to Rishikesh and Dehradun which are located at a distance of 234 km and 250 km from Kedarnath respectively. 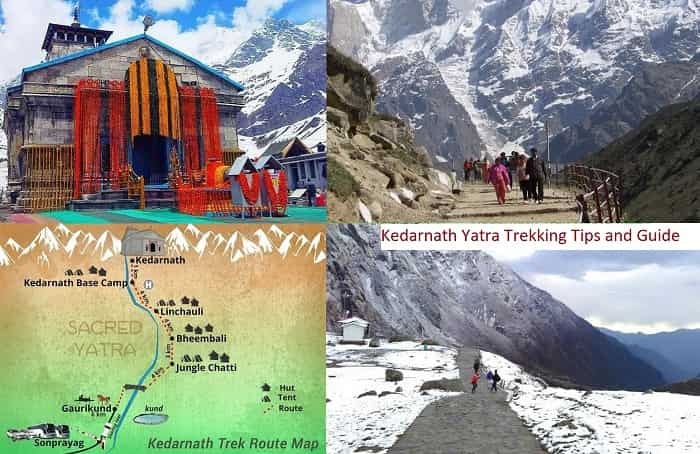 Before that heavily destructive flood in 2013 in which thousands of precious lives were lost, devotees had to trek for almost 14 kilometers from Gaurikund to Kedarnath via Rambara. The route was very nicely built with fences, shops, shelters, and public conveniences in between. However, the trek was quite lengthy but the scenic beauty of the landscapes hinders the distance factor. The lush green valleys, snow-clad mountains, dense forests, and waterfalls leave you spellbound. As per the tourists, the old route was very safe and easy to cover. Why Was the Need to Construct New Route of Kedarnath? After the destructive flood in 2013, NIM (Nehru Institute of Mountaineering) team members planned to construct a new route to Kedarnath as Rambara was completely washed away in the flood so the newly constructed bridge is the only landmark to Rambara. Various team members were indulged to plan the best suitable route to Kedarnath. Now, the new route to Kedarnath is constructed from Rambara and Linchauli. The route commences from Gaurikund and ends at Kedarnath which covers a distance of almost 15-16 km. Kedarnath is reachable via Linchauli as Rambara was completely washed away in 2013. How Did the Idea of a New Route Come? In this way, the idea to construct a new route came to NIM. Prime Minister Narendra Modi intends to make Kedarnath Temple much stronger and resplendent. He has planned to construct a new route named “Aastha Path” which is around 5 meters wide and 400 meters in length. The construction of this Astha Path starts on the top of the security wall built at the river bank of Mandakini. The overall cost of this construction is around 50crore. Around 40 meters of the path is constructed which will be used by devotees to enter the temple. This new arrangement planned by Narendra Modi is definitely going to help us out in negotiating the problems of tourists visiting Kedarnath. Summer is the ideal time to visit Kedarnath as the weather is quite favorable and pleasing in summer. The temperature ranges from 15 degree Celsius to 30 degree Celsius. The cool salubrious breeze and little warmth make it a perfect time to visit Kedarnath. However, the place doesn’t experience much rainfall but whenever it rains heavily there is a chance of a destructive landslide. The roads get blocked due to landslides and you may not complete your trip. Winter is not a good option to plan your Kedarnath as the temple is closed and due to the freezing temperature and heavy snowfall. But if you are in Kedarnath for experiencing snowfall then winter can be your best option. Proper planning can make your journey smoother and more enjoyable. Day time in Kedarnath is quite pleasing but at night the temperature falls down so to keep yourself warm carry heavy woolen with you. As you need to trek for almost 15-16 km so a pair of comfortable shoes is definitely going to help you walk on such steep terrains. Due to its high altitude location, it is difficult to stay connected with your family and friends. So carry a well-networked phone with you as most of the networks don’t work there. Companies like BSNL, MTNL work at such altitudes.